The French Riviera of the East, Puducherry is the home of a lot of tremendous heritage buildings that stands firm as the proud representative of charming Tamil and French styles of architecture. The city that is uniquely modeled in a pattern of regularly spaced horizontal and vertical lines separates the urban centre into two distinguishable colonies. The enthralling Tamil section is basically located on the western side, and the French section is located on the eastern side of the canal that separates the city. The Indian National Trust for Art and Cultural Heritage, shortly referred as INTACH, basically a non-profit-making administration put together during the year 1984 to protect and conserve the huge natural, progressed and ethnical heritage of our country. INTACH in association with the Tourism department of the Government of Puducherry officially offers 2-hours guided walking tours for the asking, that usually begins at 4 in the evening from Le Cafe (situated on the Beach road). Puducherry, being a small town, it will be an absolute joy if it can be explored on foot! 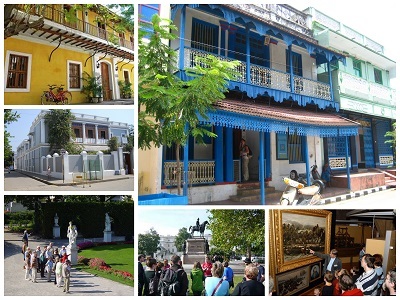 Find below the three extensive heritage walks covering the best of this magical urban centre of Puducherry. What are you waiting for, let's hit the road! Aurobindo Ashram, located at the Marine Street, White Town, Puducherry is a significant contributor to the social, economic and spiritual progress of the union territory of Puducherry. Consequently, there is no surprise over the fact that the Aurobindo Ashram along with its assorted subdivisions features a lot of delicately beautiful heritage buildings in the city. The itinerary of Ashram Walk deals with the northern division of French Puducherry, directing the people through a lot of distinguished constructions of French ancestry. The Ashram Walk also extends few stop points at some famed retail stores that are specialized in offering ashram products. Ashram Office (starting point), Ashram Library, French Institute, Ashram Playground, Le Foyer de Soldat, Ashram and Samadhi, Gloconde, Auroshika (store), La Tienda (store), Boutique d’ Auroville (store), Auroshree (store), Vak Bookshop (store) and Ashram Dining Room (ending point). The edifices in the Tamil influenced streets are distinguished by courses of tile roofed constructions almost connected sequentially by an uninterrupted wall to wall structures. Typically, the aged edifices in this quarter still hold their Tamil touch, but the case if different when it is about the more recent structures that have adopted some French influences. This singular combination of two different architectural styles featured is now widely referred as Franco Tamil architectural patterns. Although unappealing alterations resulted in the ruination of numerous fantastic properties in this quarter, increasing consciousness and noble work by nongovernmental organizations like the Indian National Trust For Art and Cultural Heritage, have guaranteed renovation of a few of the constructions. Easwaran Kovil (Temple also the starting point), Easwaran Koil Street Houses, Bharathi Museum, Calve College, Susheelabai School, Calve Supraya Street Houses, Big Market, Residence of Anandha Rangapillai and VOC School (ending point). The constructions in French division of the union territory are literally a lasting bequest of Gallic history in our country. The French buildings evidence the account of a colonial adventure in a far-off soil, surmounting a hard terrain and the historic contention between the European forces that include the Dutch the Danes and the British. The heritage walk on the French quarter conducts you through the streets that are positioned in a well-designed grid model. The Gallic buildings are easily recognizable by their ornamented entranceway curves, garden courts with painted bougainvilleas (decorative woody vines of the genus Bougainvillea featuring magnificent red or purple flower bracts) and the constructions are multicolored in splendid chromaticities of lime and peach. Puducherry Tourist Information Centre (starting point), Hotel de Vile, French War Memorial, Gandhi Statue, Toy Museum, Old Light House, Nehru Statue, Romain Rolland Library, Puducherry Museum, Raj Nivas, Ashram Dining Room, Cercle de Puducherry, Legislative Assembly of Puducherry, Park Monument, Puducherry Art Gallery, Notre Dames des Anges Church, Joan of Arc Statue, Church of Capuchians, Lycee Francaise, Le Grand Hotel d Europe, Hotel Lagrenee de Meziere, Hotel de L’ Orient, Alliance Francaise, Ashram Theatre, Dupliex Statue, Ecole Francaise d’ Extreme Orient, Court.